Much has been written and said after this past summer season about the need to lower tire pressure before driving on the beach. The issue became one of this summer’s biggest, with over thirty cars being stuck one weekend day at Ramp 44 on Hatteras Island. The need to “air down” before venturing out onto the sand remains an area of concern for both the National Park Service, as well as other drivers who have to deal with the challenges of multiple “stuck” vehicles in their path. If you read comments online, there are many different opinions expressed but the opinion of most experienced beach drivers is that it is imperative that you lower tire pressure significantly before attempting drive on the sand, normally reducing air pressure to at least 20 pounds or below. It seems one of the biggest deterrents to beach drivers failing to “air down” surrounds their questions of what do they do after they leave the beach. Many who come to the Outer Banks on vacation, as well as those who live here, keep their tires aired down for significant periods of time. They do not “air down” and “air up” each time they use the beach. Maintaining reasonable highway speeds, in the area of 40 to 45 mph does little to compromise a vehicle’s tires, certainly over a limited period of time. If you choose to drive on the beach, one thing that should be done is to become familiar with tackle shops or other locations that provide air stations. Many of our NCBBA Weigh Stations, listed in this newsletter, provide free air. In Corolla, for example, there is a new air station in Corolla Park with six air pumps. Many stores or gas stations up and down the beaches provide free air such as The Blue Whale in Salvo, Askins Creek Store in Avon and the Oregon Inlet Fishing Center. Become familiar with the available air stations around areas of the beach you enjoy. Please be courteous, failing to properly “air down” before entering the beach can create problems for other conscientious drivers, can make for an expensive afternoon, damage your driveline and lessen the enjoyment of all who use our beaches. Your vehicle may have oversized tires and be capable of traveling on the beach with full air pressure but there is a good chance that it will create ruts making it difficult for those who follow. Suggested equipment for beach driving is a shovel, a tow strap, a jack and a board to place under it. An air gauge is mandatory and four-wheel drive (4WD), although not mandatory, is highly recommended. All-wheel drive (AWD) and low ground clearance vehicles frequently have problems on the beach. Beware brown sand and drop-offs. We want everyone to enjoy the beach driving experience by being properly prepared. As NCBBA members, let’s be the ambassadors out on the beach, setting the proper example for others by “airing down” before we head out. 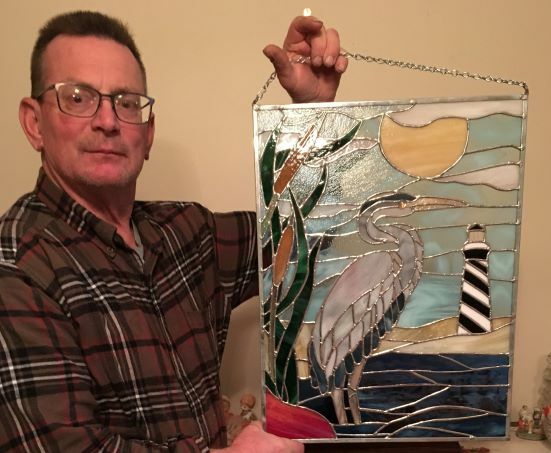 For your convenience, we have listed Weigh Stations who have air..
Congratulations to Barry Brittingham #12723, DE, on being the winner of the “Blue Heron” stained glass. The raffle made $1290 for the organization. Again thank you Tracey Oates #11240 for donating this beautiful artwork. Tracey already has in mind the pattern for next year’s artwork. Over the years we have had a few Junior Anglers participate in the Red Drum Tournament. These anglers have had a good time, and some have been very successful. To encourage more Juniors to participate and more adults to “Take A Kid Fishing”. Tommy Farmer, Carolina Cast Pro, has agreed to sponsor two Juniors (15 and under). Tommy’s generous offer is a challenge to all of us to get more youth involved in NCBBA activities. We will have a Junior Angler drawing on Awards night to pick the winners. Only those registered and fishing in the tournament will be eligible to participate. If you would also like to sponsor a Junior in the tournament, please send a check for $100.00 to Tom Heggie, Treasurer NCBBA, 909 Cedar Drive, Nags Head, NC 27959. Please indicate it is for a Youth Sponsorship for the Red Drum Tournament. Junior Anglers enjoy the same tournament benefits as Adult Anglers. Take A Kid Fishing! Tell your spouse what you are planning to do and give them a vacation. Better yet, bring your spouse and make it a family affair. Applications are available online. Click here for more information. Hope to see you at the Tournament with a Junior Angler!